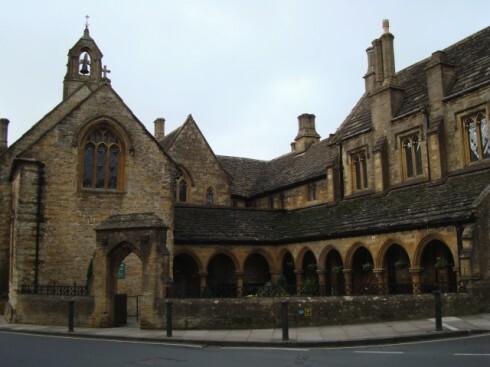 What might we learn from the construction, between1438 and 1448 of the Hospital of St. John in Sherborne (see above) that might shape the way we think about construction in the 21st century? While the bulk of the building was built using local oolitic limestone, it was dressed with Lias stone from Ham Hill, some 12 miles from the building site. However, in those days, without the internal combustion engine, 12 miles was a long way to carry stone (you try it). The meticulous accounts kept of the project at the time show that the cost of transporting the stone by cart cost more than the stone itself. 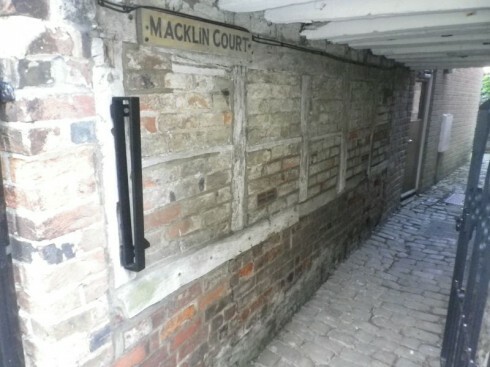 As Alec Clifton-Taylor says in his seminal ‘The Pattern of English Building’, “it was the great difficulty of transporting heavy materials which led all but the most affluent until the end of the eighteenth century to build with the materials that were most readily available near the site, even when not very durable”. 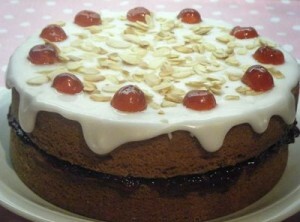 I often use the analogy, in terms of food, of a cake. Until recently, local production provided the cake (the bulk of our needs) and what was imported was the ‘icing’ and cherry on top, nice to have but we didn’t depend on it. What cheap energy and globalisation has created is a situation where now the cake is imported from wherever in the world it can be found cheapest, and local production is just the icing. In the same way that for food we need to urgently reverse this, for many reasons that will be only too familiar to regular readers of this blog, the same can be argued for building materials. 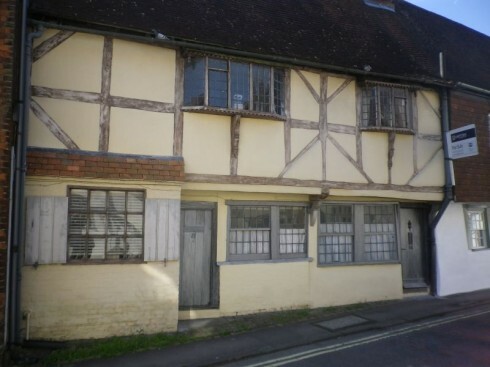 In the case of these alms houses in Sherborne, it literally was the building’s ‘icing’ that caused the difficulties. With about 30% of UK road freight now due to the movement of construction materials, many of which already have a high level of embodied energy, I’d like to argue here that we need to think about construction in the same way we are starting to think about food, specifically in the context of the Atmos Project, a community initiative I am involved in in Totnes. “… as materials closer to their natural state will tend to have had less processing, which often means less energy use, less waste and less pollution. 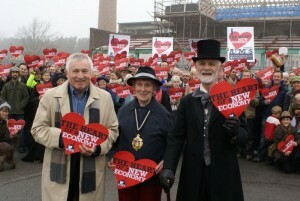 Local materials can reduce the need for transport and benefits the local economy and community”. Then there’s also the aesthetics. The other day I was in Marlborough in Wiltshire, and took a walk around the town. It is easy to be nostalgic about old buildings, and to assume that they are so characterful and attractive simply because they are old. I would argue that the ambience that comes through in some of the photos below has more to do with the materials than with the age of the building. 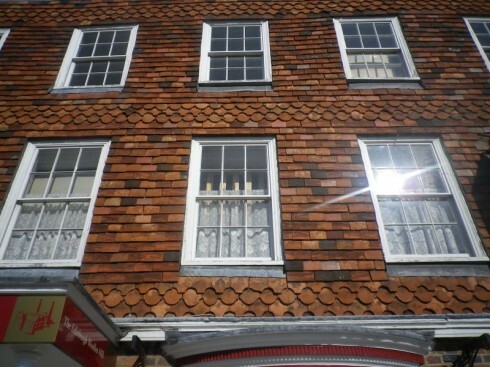 The combination of brick, timber and cobbles is far more attractive than just one single material. Clay wall tiles that were fired in kilns with variable temperatures produced tiles of a range of colours, from black to orange, which gives the tiled surface much more richness. This timber frame house is a beautiful example of how the materials available locally dictated the design of the building and its character. There has been a resurgence in interest in the use of natural and local building materials in recent years. 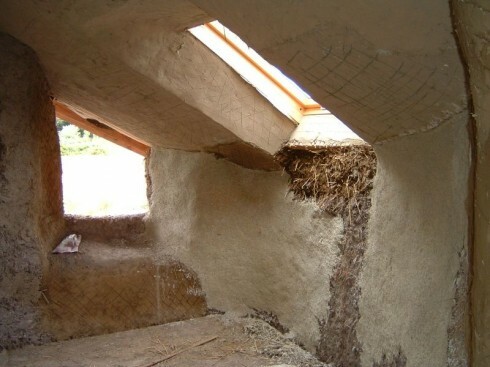 Cob building, strawbale, lime plasters, roundwood timber, hemp, clay plasters, have all experienced a renewal of energy, but are still almost only ever used in self build projects, and have yet to cross over into mainstream construction. Yet, as Gill Seyfang points out, they are still very much in a niche and what is needed is “scaling up the existing small-scale, one-off housing projects to industrial mass production”. She argues for the natural/local building niche “adapting itself to resemble the regime”. Key to that will be scale. Of course, running alongside the discussions about materials is the need to create truly low carbon buildings, in their construction, their inhabitation and eventual demolition/recycling. 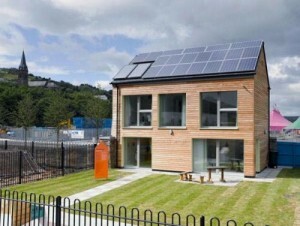 The Larch and Lime houses built recently in Ebbw Vale are passivhauses (Larch House right), that is they are built in such a way as to require no space heating. When I talked to the architect behind them, Justin Bere, he told me that most of the materials were local (stone, slate, locally made Rockwool etc) but hadn’t veered too far into the world of very local and natural materials. 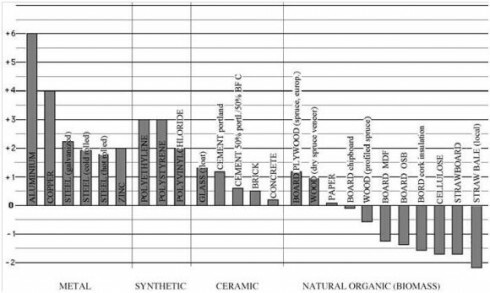 Part of the reason for that is that for the kind of accurate modelling needed for passivhaus certification, data for many of these materials doesn’t yet exist. I would argue that this is a pressingly urgent area for new research. Enter the Atmos Project. For the past couple of months, as well as my Transition Network stuff, I have been working a day a week on the Atmos Totnes campaign. Atmos has been running for the past 5 years, since Dairy Crest closed their 8 acre site next to Totnes station, and since when it has sat and become more and more of an eyesore (you can read the story so far here). The Atmos Project, as it became known, due to it being home to a building built to house Isambard Kingdom Brunel’s experimental ‘atmospheric railway’, has sought to bring the site into community ownership to develop it as a catalyst for new businesses in the town and as a demonstration of Transition in action. The initiative did a lot of work, raised bits of funding to do design work, business planning and so on, but seemed to be getting nowhere due to the site’s owners’ unwillingness to engage seriously with the community. So a couple of months ago we started a campaign, aimed to bring sufficient pressure to bear on the site’s owners. We gathered voices from around the community, got a lot of media exposure, got people in the town out for a big photo opportunity and for a public meeting, and a couple of weeks ago, had a very positive meeting with Dairy Crest, and all of a sudden the project is moving forward with an energy that is a delight to see. 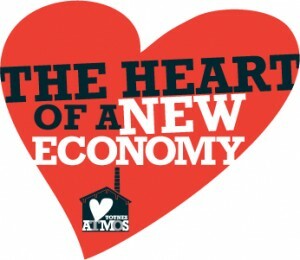 The tagline for the campaign has been ‘the heart of a new economy’, and it is seen as a development that in all that it does is focused on skills, training, the creation of new businesses and the boosting of the local economy. It is of a scale where it can do some very exciting things in terms of construction. One of the founding ideas is that the place that the development starts its very first question, is what are the local materials that we have to hand? In the same way that I always used to teach on permaculture courses that the question should be “I’m going to cook a meal, what’s in the garden”, rather than “what’s in the fridge?”, that same principle could and should apply to building materials. Timber: for construction grade timber, internal studwork, window and door frames, roofing shingles, laths, panelling, flooring, wattles, wood fibre insulation. It used to be that when a cathedral was built, a temporary village was built around it, with a stone masons’ quarter, a timber framers’ quarter and so on. On the scale of something like the Atmos project, it may well be possible to do something very similar, processing the timber needed on site, making cob blocks, even hand-making tiles for external cladding. If done skilfully enough, integrating training and apprenticeships, it could be a vitally needed new approach to development, especially when combined with the potential for the community to invest into the development. 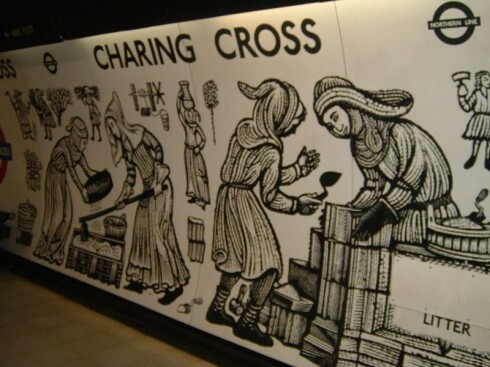 Panels at Charing Cross tube station in London showing the various trades associated with the construction of Charing Cross in the late 1200s. A development that from the outset seeks to source it’s metaphorical cake locally. As the Euro crisis continues to unravel at a pace, as the academics are telling us that the only thing that will halt climate change is a massive economic downturn, or at least a huge rethink about how we make economic activity happen, we need a new approach to development. Could it be that we could create new housing, and new work spaces in such a way that each new development produces houses that lock up a lot of carbon in terms of their materials, generate very little carbon during their inhabitation, which create a diversity of new enterprises and livelihoods, show what deep public consultation in relation to development really looks like, all kinds of trainings, opportunities for people to invest in and benefit from the development, which create a huge sense of excitement and anticipation, invites the local community to get involved at regular stages and which create buildings and developments that feel timeless, rather than bound to a particular short-lived era of architectural fashion? I think so. I think the time is right for that, and that’s what we want to do with Atmos. Watch this space. Carl is a retired Ecology professor, a pioneering teacher of Environmental Studies and environmental economics; and when he and his wife wanted to build a home to retire into- they did it from the bottom up as case study. He documented everything, and it’s highly readable. Local materials was a huge part of the considerations- you’ll find plenty to stimulate your thinking.